This crime drama takes yet another stab at re-interpreting the Sherlock Holmes character. In this case, Holmes is a British detective who ends up fighting crime in present-day New York City. He's teamed up with a no-nonsense female surgeon who helps him solve mysteries in his trademark eccentric way. Holmes engages an old foe to protect his father after he learns Morland (John Noble) is in danger of being killed. Also, Holmes and Watson search for a killer connected to the tobacco industry when a lawyer who was in the process of reviewing a major cigarette distributors finances is murdered. Holmes and Watson get tangled in homicide and magic when they investigate the passing of a magician murdered while performing a traditional act. Holmes and Watson look into the murder of a man Sherlock thought of as one of New York’s worst private detectives. Sherlock and Joan wonder how well they know Shinwell when they examine the possibility that he may have gotten away with the unsolved killing of his friend, a fellow gang member. In the final episode, Joan and Kitty attempt to prove that a string of killings, stemming from an old case Sherlock and Kitty solved in London linked to an international government conspiracy with the Defense Intelligence Agency at its center. Holmes' former protégé, Kitty Winter, comes back to New York after a three-year absence to warn him that a murderer is killing everybody associated with a case they worked on together in London. Holmes and Watson examine the homicide of a former professional eSports video gamer who passed away after being attacked in front of his fans during a live video stream. A guy takes hostages, including Joan, and threatens to kill them unless Holmes discovers the person responsible for the death of his son. As Sherlock looks into the case, the captor gives him 16 hours to locate the perpetrator before time runs out. When Holmes and Watson examine a clown's murder upstate, they find a link between his death and the invention of a new weaponized virus. Also, Watson assists Bell when he's targeted by his new romantic interest Chantal's ex-husband trying to sabotage her job at the district attorney's office. Holmes and Watson hurry to locate a woman who's been held prisoner for years before the abductor takes drastic steps to avoid being caught. Also, Watson grows distraught when Shinwell refuses to zone in on his informant training with her and Holmes. When Watson is possibly involved in a DEA investigation into doctors filling out illegal prescriptions, she and Holmes look for the person using her medical license to sell drugs. When Shinwell visits Holmes and Watson for assistance after he's framed for a gang killing, they have three days to locate the actual killer before he is arrested and locked up again. Joan fears Sherlock's sobriety is in jeopardy when she finds out he has been lying to her about going to recovery meetings. Also, Sherlock and Joan find out a guy's death caused by ingesting poisoned sausage is linked to a lab working on a breakthrough in the artificial meat industry. Holmes and Watson examine a mass homicide when a chef and his patrons are poisoned after enjoying a tasting menu tainted with snake poison. Also, Detective Bell's crush on a coworker makes Holmes figure out his and Fiona's relationship is at a critical crossroads. Holmes and Watson have a number of suspects when they investigate the killing of a man who led a secret life as a vigilante, "catfishing" sexual predators on dating sites and publicly humiliating them. Also, when Shinwell's criminal record keeps him from getting a full-time job, Holmes disagrees with Watson's idea to help him. Captain Gregson petitions to include Holmes and Watson when his unit is chosen to get a city commendation for its exemplary work. Also, as Holmes and Watson consult on the examination into a financial analyst’s killing, they are pulled into the world of asteroid research. Holmes discovers a secret concerning Captain Gregson's girlfriend when she employs him for a case she wants kept under of Gregson's radar. Also, Holmes and Watson join the NYPD's search for an abducted lady. When the head of a local street gang captures Holmes to force him to locate the person responsible for a hit on his men, Holmes and Watson get stuck in the middle of an international search to recover a centuries old, priceless artifact. Also, Watson considers whether a personal favor Shinwell requests of her is outside her comfort zone. The truth revealed, Holmes pursues his nemesis, Moriarty, despite a warning to stay out of it. Holmes opts out of trying to find Moriarty so he can protect Irene... but can he? Moriarty enlists the help of Holmes... in exchange for giving him some answers; Holmes tracks down clues in a 22-year-old murder. Moriarty resurfaces again, this time with a new lackey who makes his murders look like accidents. Holmes and Watson race to find an accomplice before news of a blackmailer's murder causes him to release all of the victims' secrets. Watson and Holmes uncover a huge robbery plot using the major storm heading into the city as cover. Holmes gives Watson her first official case, to find a missing woman, while he investigates the old murder of a woman in the subway. Holmes reunites with a criminal profiler that he cannot stand as the two pursue an escaped serial killer who has a vendetta against her for ruining his family. As Holmes works on training Watson, the two investigate the claims of a wealthy man who believes that he has been dosed with a hereditary disease that will kill him. 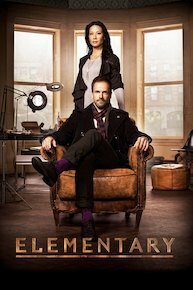 Elementary is currently available to watch and stream on CBS. You can also buy, rent Elementary on demand at Amazon, Hulu, Vudu, FandangoNow, Google Play, iTunes online.